Lately, we’ve been offering a lot of advice for reducing workplace stress. That’s because we believe workplace stressors shouldn’t get in the way of a happy, healthy life – and we’re sure most employers would agree. One aspect of employee stress that doesn’t get the attention it deserves is financial stress. Fortunately, a lot of companies are getting on board and addressing the importance of financial wellness. The rising popularity of financial wellness programs was an expected workplace wellness trend of 2017. More and more companies are starting to offer financial wellness programs for employees – for good reason too. It’s clear that employers are aware of the dangers of financial stress in the workplace. According to GreenPath Financial Wellness, 78% of employers say financial concerns can have a negative impact on employee productivity, while 71% of employees say their top source of stress is personal finances. Employees struggling with financial troubles have difficulty focusing on work and performing their best. GreenPath also found that 58% of employers reported financial “illness” playing a role in employee absenteeism. Like other types of chronic stress, financial stress can be both mentally and physically draining. Stressed employees can experience digestive problems, headaches, insomnia, and depression. If you don’t want your company losing valuable time and productivity, providing financial resources and support for employees makes good business sense. Not to mention, providing such resources proves to employees that your company cares about their overall health and wellbeing. But what can employers do to help? Companies that currently have a wellness program in place can easily incorporate financial health into existing wellness strategies. If you don’t have a current wellness program in place (which you really should! ), you can also build a stand-alone financial wellness program by leveraging any existing benefits. Providing an effective financial wellness program takes a lot of work. It’s a job that shouldn’t just be handed off to one or two HR professionals or the wellness coordinator. Working with a third-party is an excellent solution for offering financial wellness support without causing more stress within HR. Employees might also feel more comfortable working with an outside company. Finances are a touchy subject, so many employees might be hesitant sharing this information with someone at their own workplace. Be picky during your search to find a company that’s right for your employees. A good financial wellness program will educate, inspire, and coach employees in a personalized manner. Before you start your financial wellness program, determine your financial wellness goals. What is the company hoping to gain from the program? What do employees want to learn from the program? A good place to start is an anonymous employee survey. Ask employees to identify the main sources of financial stress. Are they struggling with credit? Are they taking advantage of current benefits such as a 401k plan or an FSA? Do they find budgeting and saving money difficult? Analyze the findings of the surveys to establish goals and objectives for your program. You might be tempted to focus on just one aspect while incorporating a new financial wellness program. However, it’s important to keep in mind that these programs must be holistic and comprehensive to be effective and lead to healthy behavior changes. Instead of focusing strictly on the basics of budgeting, for example, your program should cover areas such as saving for retirement, building wealth, and handling debt. Be sure to tie these aspects back into current company offerings so that all employees can learn and improve from the financial wellness program. Financial wellness isn’t a one-and-done deal – and you can’t expect overnight results. One event covering financial education simply isn’t enough. It’s important that financial wellness is taken one step at a time. Offer different lunch and learn sessions and seminars throughout the year. Give employees year-round access to different financial resources and professionals. Just like nutrition and physical activity, financial wellness takes practice and ongoing education. By putting a focus on financial wellness, employers can expect reduced healthcare costs, increased productivity, reduced absenteeism, and improved employee recruitment and retention. Access to financial resources and training will help lower employee stress levels and give them one less thing to worry about. 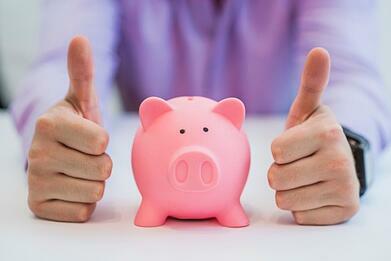 Keep these tips in mind when developing your financial wellness program. How does your company address financial wellness? Let us know in the comment section below!